Former Crown Prince Paras Shah has said that the monarchy may return in the country if people wanted it. 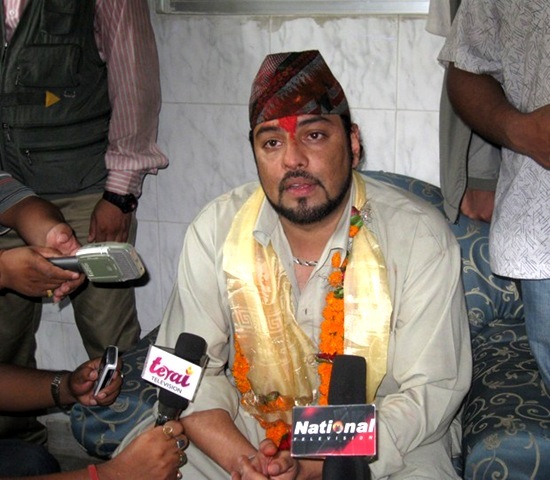 Paras was speaking to the media persons in Birgunj on Wednesday, April 28. He also added that, he is not interested to become a king. Paras Shah is living in Singapore after the royal family was forced out of the palace. The controversial statement follows the similar statement of the former king Gyanendra, who said – the monarchy is not finished yet. Paras: I am here for religious and social work. I request you to limit it to that level and understand that this is not the time to talk about politics. I will talk about what the people want when the right time comes. Q: When will that time come? After Jestha 14? Paras: It is in the hands of people. Q. One of the media house in Singapore reported that you told about organizing a political party and participate in polls. Paras: I haven’t told like that. Media people write things after alteration. I haven’t talked like that. If the people want any thing can happen through polls. Q. Do you see any chance of return of Monarchy? Paras: It all depends on future. Anything can happen. You can see the people participation here. I think it all depends on the want of people. Q. Will the Constitution 2047 be in active again in the new constitution is not complete by Jestha 14 ? Paras: I don’t know about that. I am not a political person. Q. You look more handsome than before? Paras: Don’t talk like that (with clapped hand). Q. What do you say about the participation of people here? Paras: It doesn’t matter what I say. You say how you see it? Paras: I am very happy, you can see. Personally I am very happy. You have to understand. You have to tell the people about it too. Q. Will you become a King if people choose you to be one? Paras: Personally I might not be a king. Institution is another thing. What ever we do is for the institution not for a person. I think, that is more important. Q. What do you think about making it a Hindu country? Paras: Look, I am a Hindu. I am here to worship. This is a political question. It is difficult. If I talk about it, some may like and some may not. So, I don’t want to get in it. Paras: If I talk about it, it will be a political issue. Q. Is the monarchy institution planning to do something on the political deadlock? Paras: We do what the people tell us to do. We are the worker of the people. We respect people so we left the throne for the people. For peace. There should be peace, shouldn’t be any killing. Q. You have been living in Singapore for the long time? You are now in Nepal. What shall we interpret on your activities? Paras: I came Nepal on Sunday. I am on my way to Birgunj. Q. Will you return back to Singapore? Paras: I will return soon. The weather is not good here. Q. What do you want to tell the people through the media? Paras: Look, we shouldn’t go to war again. 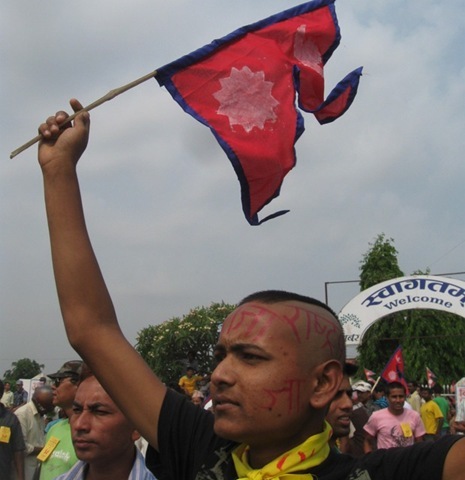 Nepal needs peace. We need development. You should support in the process. Look, solution should be reached through peaceful process. This entry was posted in Nepal and tagged Paras Shah, Royalty. Bookmark the permalink. Hey Someone from USA but Nepali, I was also from Nepal but living in Earth. What are you gonna do to humanz, Kill em? just like Shah Monarchy , Rana did it for years, you may say new revolution took lives as well, but think “use your USA brain(Hoping you are studying)”.What Happened in the past was always sheltered, now what is happening is in front of your eyes. If Paras and his grandparents killed 50 people behind the curtain and new revolution killed 10 people in front of your eyes.It is hard for you take, all you saw is 10 people , you didn’t bother asking those 50 people behind the curtain. The whole point is Humanity, forget about the religion forget about the politics. di you ever ask yourself , why do you have guts to talk about things now? because you are living in freedom speech country , your brain developed accordingly. So keep hoping for the best and Do not wait for Monarchy to come back. vai talai k tha . aile nepal ayerw herna nepal ko awasth afnai desh ma darlagna awastha xa . hope taile panhi padis hola . 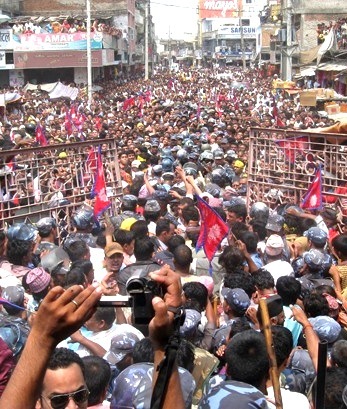 ek xoti nepal ma ayerw kei kam garauna jha tw anhi balla thapauxs maile galat boleraixu vanne . your son shall/may be the new light……it depends on the will of the himalayan masters…. hey the people of nepal,paras is right. now the royal family is in right track they are telling good thing we the people of usa thought that the country will take care by shah family it self it will b good. now the mouist need to go to jungle again and then mouist will not get any help from the public . B carefu mouist people B careful now.BUT one thing hei shah family if u get your country agin dont try to hurt the public anddont give hole power to army and police in the country because all public people the hate army and police and their act .ok thank to saha family.